Grabbing an after school snack or something to nosh on while you watch a good movie is sometimes the most enjoyable part of a day! As simple as a snack can be, they’re also just as satisfying. But there’s one snack that trumps them all. It’s crunchy, triangular, and goes great with salsa! To a tortilla chip maniac like myself, the answer should be obvious, but if you need me to, I’ll try and break it down for you just why it is that tortilla chips are so great. Let’s see…where to begin, where to begin? First of all, I’ll tell you how tortilla chips are made. You take a corn tortilla like you’d use to wrap a burrito and you cut it into wedges. Then you fry it (some tortilla chips are circles which are simply circle cutouts of a tortilla and then fried). Now for a little history: Tortilla chips were first made sometime in the 1950’s, invented by a woman named Rebecca Webb Carranza. Along with her husband, Rebecca owned a tortilla factory in Los Angeles. They were one of the first people to automate tortilla production. The Carranza’s automated production would turn out the occasional imperfect tortillas which they would throw away. But one day Rebecca got the idea to cut the “bad” tortillas up and fry them. She’d sell a bag of these “chips” for a dime (which was the equivalent to today’s dollar—maybe more). It wasn’t long before tortilla chips caught on by the entire nation. Since they go great with so many different appetizers and dips they’ve become quite a popular chip. 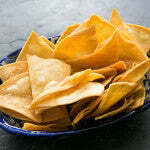 Celebrate National Tortilla Chip Day and enjoy a bag yourself. Maybe you can even make your own!